All experiences, good and bad, are important for the overall development of the child. Bullying is not one of them. Bullying can have rather serious effects in a child’s personality which, studies have proven, stay on as negative personality traits or remain the root cause of depression or anxiety in adults. Almost all of us have faced some sort of bullying as kids. Most of us could come out of it before it got ugly, but some of us went through the horrible phase that left a canker, and is still difficult to heal. Boys tend to show physical or verbal aggression. In sports, they might tend to bully a new comer or a co-player into doing the dirty work for them. Or might make fun of a (likely) feeble teammate. Girls resort to more of relationship bullying wherein they might not include a teammate in their group, or refrain others from talking to a particular kid, or may even spread rumors about the child. 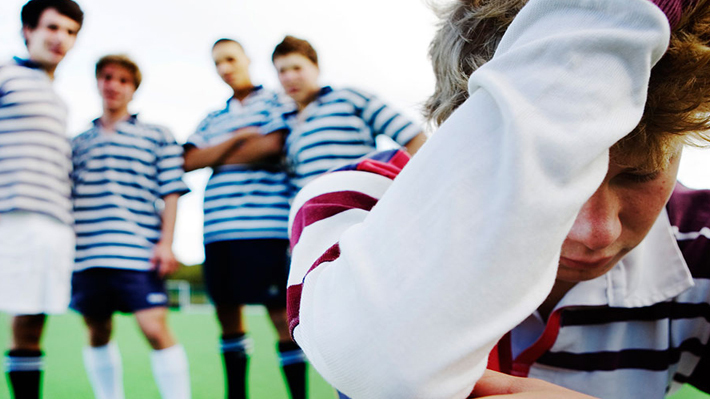 Sports bullying takes a whole bigger magnitude by directly affecting game skills or the confidence of the victimized child. Most likely your child is being party to one or the other forms of bullying. It might start as a little joke but can things can turn real ugly even before you react to it. With such dire consequences, it is highly recommended that parents talk about bullying with their kids. A candid conversation wherein you comfort your child to speak her heart out, listen more than speak and most importantly empathize with the child, can be a great stress reliever for the child. As mentioned above, have a candid conversation. Listen carefully. Be supportive. Do not jump to conclusions. Do not judge, criticize or blame either, the bully or the victim. If it is just light fun type of bullying, you might want your child to ignore it. But if you feel the bullying is seriously affecting the child or is of real serious nature, try to find the triggers. Ask the child why does she think she’s being bullied. Try and analyze the triggers. There can be feeble kinds who are insecure, withdrawn, anxious or socially awkward in some sense or the other. That child would need counselling. You would need to make conscious efforts to bring up the child’s personality and confidence. There are chances that your child’s over aggression or superiority complex is making her a subject of bullying. In this case also you would need to counsel the child and work on her social skills to make her socially successful. If you come to know that your child is the bully, you should act immediately on it. Bullying indicates aggression which is a result of some sort of disturbance the child is deeply going through. This type of behavior, if not tackled, can lead to a criminal or offending personality. You need to talk to your child, understand what’s bothering her. In most cases children are just craving for attention or love or both. Talk to her, spend time with her, seek professional help if you feel it’s beyond you. If you can, talk the child out of it. Tell her the ill effects of bullying. Also tell her how hurtful and intense her actions or words can be for the victim. Tell them about the long-term effects of bullying on a child’s psychology. Bullying, for either party, is a scar on the child’s psychology and overall personality and it needs to be addressed to on an immediate basis. Ignoring it will not curb this menace, understanding and addressing it will.